Two of my enamel works were selected by jurors, Kat Cole and Sandie Zilker to “InFlux”, the Enamelist Society’s Online Student Exhibition. The exhibition is available on the Enamelist Society’s website. 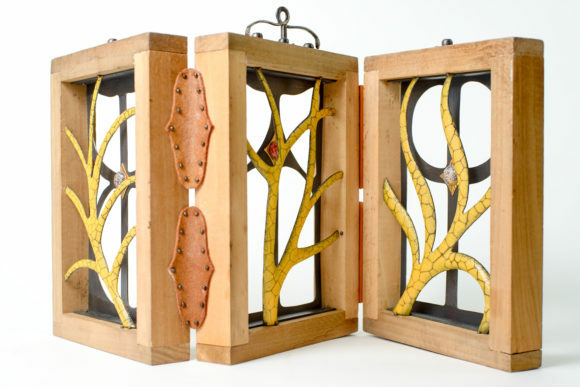 “Doors, not Walls” (2017) is a 3 panel folding sculpture with pierced oxidized copper ‘doors’ on one side and enameled copper ‘vines’ blocking the reverse. Materials: Copper, enamel, 24k gold plating, wood, leather. 9″ x 17″ x 7″. 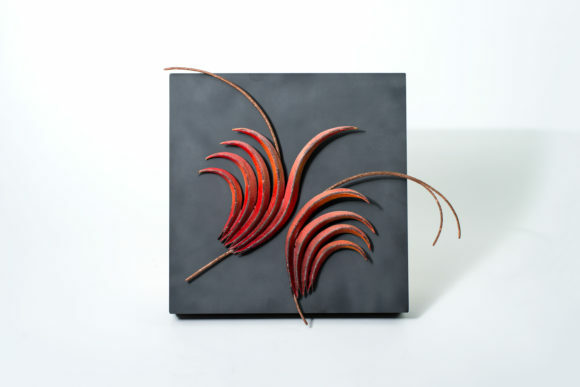 “Blaze” (2016) is a 12″ x 12″ wall piece made from enameled fold formed copper mounted on a wooden frame.